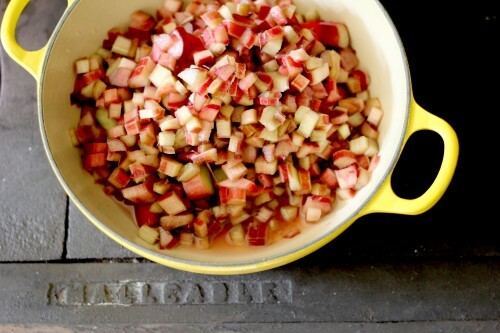 Now, cut up about 5 cups of rhubarb into 1/2 inch slices and sprinkle 1/4 sugar over top. Let that sit an hour or two until the juices are released. Pour off the juices and boil until you have a thick syrup, this will only take a minute. 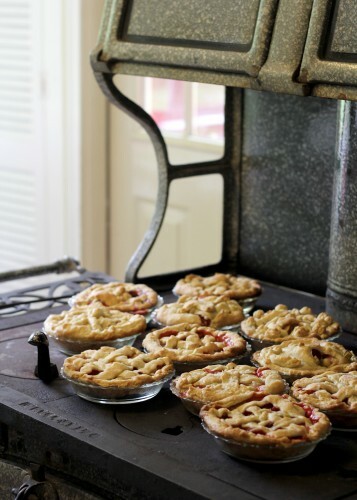 (I use this technique for all juicy summer pies to ensure that the fruit holds its shape.) Now put the syrup back into the fruit. Stir in the cherries, and the sugar/tapioca flour mixture and stick all that in the pie pan on top of the uncooked bottom crust. Now top with a lattice crust. (Directions below) And by the way, you should always, always, always top your red pies with lattice. The red is oh so beautiful peeking through the little holes. And, goodness sakes, MAKE YOUR CRUST! We’ll talk crust soon. Crust deserves a video. 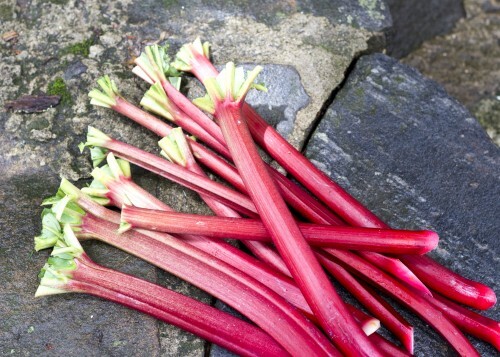 Cut rhubarb into ½ inch slices. 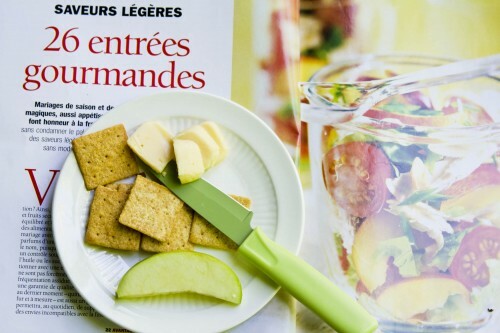 Combine with 1/4 cup sugar and let mixture sit until juices are released. Pour off the juices and boil down until you have a thick syrup. 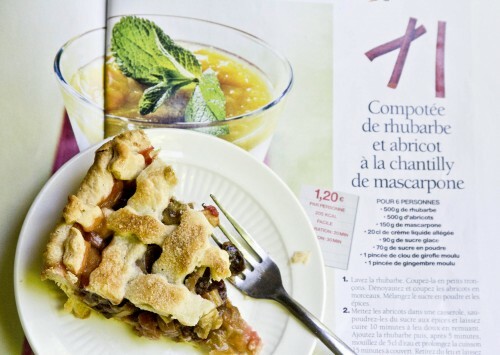 Stir that syrup back into the rhubarb and add cherries. Now mix remaining 1/4 cup sugar and tapioca flour and then add that to fruit. Pour into a crust-lined pie plate, then weave the top crust. 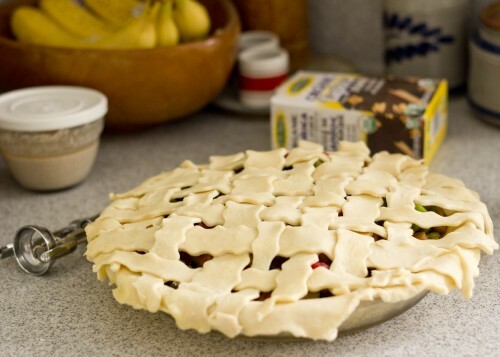 Refrigerate the pie about 30 minutes before placing into a preheated 425º oven in the bottom third of the oven. Immediately turn the oven to 400. After 15 minutes, turn the heat down to 375º and place a piece of foil on the oven floor or under the pie. Bake until the pie bubbles all the way through*, about 30 more minutes. Cover crust lightly with foil if it’s browning too quickly. Let it cool about 4 hours before slicing and watch out for pie thieves! *If you use corn starch, the pie must bubble in the middle for at least 3 minutes in order for the starch to cook through. With tapioca flour, the pie will be done when it’s bubbly on the outside and just begins to boil on the inside. I add a handful of dried fruit to all my summer berry pies to ensure that it sets up well enough to slice. Cut your rolled dough into 16 strips, more or less. Lay half the strips over the filling. Starting in the middle, lift up every other strip and then lay a strip down over remaining strips. Continue to weave both sides of the pie in this manner. Fold edges of strips under bottom crust and then crimp decoratively. (There are many great videos online that illustrate how to roll, crimp, and weave a crust.) Brush crust with cream or half and half and then top with sugar, being sure not to get any on the crimped edges, or they will darken too quickly.